Manufacturer of a wide range of products which include colitri mir. Colitri Mir is the combination of colistin & enrofloxacin act additives. Colistin is an antibiotic from the group of polymyxins with a bactericidal action against .Gram-negative bacteria like E.coli, Haemophilus and Saalmonella spp. Enrofloxacin belongs tothe group of guinolones and acts bactericidal against mainly Gram-negative bacteria like Campylobacter, E.coli, Haemophilus, Pasteurella , Salmonella and also highly effective against Mycoplasma spp. 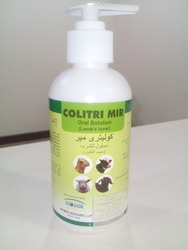 Colitri Mir is indicated as a drug of choice for Gastrointestinal infections caused by colistin and enrofloxacin sensitive micro-organisms like E.coli,Haemophilus, Mycoplasma and Salmonella spp in kids , lambs and calves. Dosage: Kids & lambs:2 pumps /5 kg of live body weight for 3-5 days. Looking for Colitri Mir ?